Please receive the gifts we have brought to our worship this morning, God, and see that they are used wisely and well, to further the best and most significant work of Christ’s church. 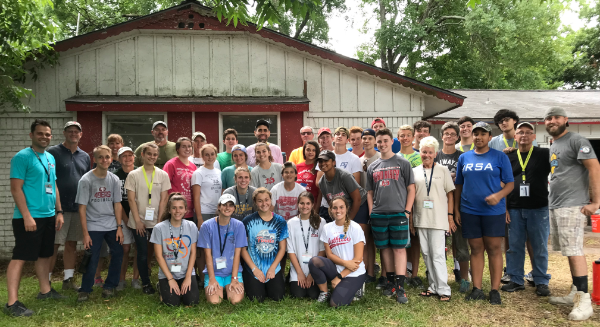 We are deeply honored by the efforts of our young people who worked on our behalf – and yours—this past week in Houston. They have offered themselves for significant purposes and a mission greater than themselves. We are honored, God, to witness and support their idealism, their industry, their faithfulness, and their love for you and others. If we are fearful that we lack the stature, the strength, the wisdom or the will to do the work to which your people are called, then show us we are not too small or insignificant to make a difference. Share our prosperity, and lessen the pangs of poverty. Comfort the grieving, and reorient the lost. Restore confidence, and overcome despair. Encourage cooperation, and diminish contention. Conquer cynicism, and reclaim your dreams for us. Remember your call, and honor it with our commitment and loyalty. Let us play our part, we pray, in bringing to reality your great dream for a realm on earth where Christ’s love reigns supreme. As followers of your Son, we would be his faithful, diligent agents. Let us all walk his path, speak with his words, and love with his heart. We pray all these things in Christ’s name today, using his very words, as we say together now… Lord’s Prayer.